You know it’s a special occasion when we offer this. This item will be a total mystery and could include any of our current Hoo-rag Dry Bags. Requests will not be honored … it’s a true mystery! PLEASE NOTE: This package is non-refundable and exchange requests will not be honored. You get what we send! 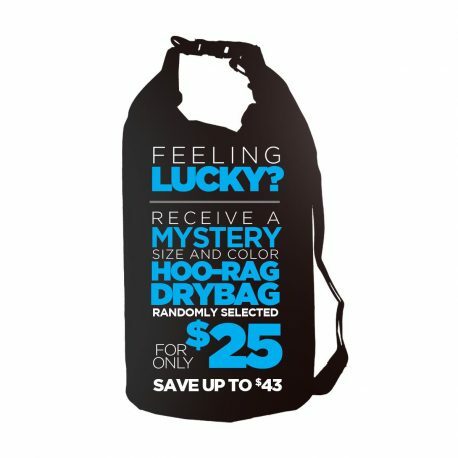 I purchased 2 mystery dry bags they were the same when I got them. But Erika the fulfillment manager was great help & very nice!!! Excellent customer service!!! Great! Would recommend. Recd one blue and one pink. And the bag was a plus. Thank you! The mystery box was a, success! The Hoo Rags were an okay design. But at the end of the day the wet dry bag was worth the twenty bucks for the mystery box. We are more than pleased, and have ordered since. The only hoorag I had was a gift from a friend so I decided to buy the mystery box and it’s awesome! Loved both patterns and the dry bag! Will purchase again for sure! I am a multi-rag owner, as well as a multi-bag owner…all the products are great…could you add a razorback Hoo-rag, as well as a way to add insect repellant…??? The patterns I don’t care for get given away….and people like them…. The two mystery patterns were great in my opinion. The bag is very nice as well. While I didn’t love the patterns I got they will be put to good use. I really like the hoorag dry bag that I got. Great value no matter how you slice it! Received my mystery box package and was very pleased! Got two great Hoorags for me and my son as well as the 15L drybag!!! Great products guys! Keep up the great work….will be buying more soon! Mystery box was a nice surprise! Dry bag is durable. Rags are of high quality and well made. I love the breathable fabric and cool designs too! I use it for outside work and when I am out on the water fishing. Very pleased with my first time order. Multiple hoorag/ mystery box owner…. great products…..keep adding university rags as well as the flag ones….especially the ones of the Caribbean island nations…..
Hoo of a deal!!!! 2 rags and bag for a great price!!! Perfect for my 2 kids and a dry sack for the boat. Can’t wait to see what I get next time…. Great box! Definitely an excellent value and I loved everything I got in my mystery box. 2 Hoos and a dry bag plus a special deal of the day! As always, shipping was fast and quality is excellent. I’ve never been disappointed. Another great order from HooRag. This is a great deal, two rags and a dry sack for 20 bucks. Quality is as expected from Hoo, phenomenal. Dry sack is much higher quality than I expected for the price. You can’t go wrong with this order. What fun… Got a really nice drybag and they sent me some Hoos that fit my style ;). I think I’m gonna try a halh Hoo next, can’t go wrong with $1 shipping. Two extra Hoo’s and a dry bag to put them in. How can you go wrong! I wear em to work so the colors don’t much matter. A joyous bundle of sunshine. Only complaint is it didn’t arrive in the “Mystery Box” as shown above. Great Deal. Was hoping for a good camo pattern but figured since they probably go fast I wouldn’t get one. I ended up getting a great pair of lighter colored ones for my Mother in law to use while out paddle boarding. I might have to keep the dry bag though. Thanks for the Hoos and the dry bag! Very happy! Took the chance and was Disappointed in the selection I received. The waterproof sack was ok but the hoorag patterns were definitely slow movers and excess inventory. I offered them to other bikers I ride with for free an no one wanted them. At least have have my next white elephant gifts. Was disappointed when I opened my mystery box. Got two hoorags that I’m sure don’t get purchased very much. They were very ugly. Also received a dry bag which I do like a lot though. Super pleased with the products as a whole, love my Hoo Rags! The dry bag and Hoo Rags will come in handy for camping and off-roading this summer! Could not be more happy with the selection of hoo’s that I got. The dry bag is great, I will be back for more. I received the American flag black hat in my mystery box. I was going to purchase the hat regardless and just figured I would wait to see if I got lucky. Well, I got lucky. I was very happy to see it in the mystery box. This was a really great buy! We got two hoos and a hat! We couldn’t be happier. We got the blue one with “hoorag” all over it, the yellow bandana style, and a Hat. We loved it! They all fit just as well as the other ones we ordered and well worth the price. very happy with this purchase. Great bargain! Loved the Hoorags I got and am ready to go fishing! I bought two of these, and was very pleased with the deal. The only issue I have is, neither hat will adjust out large enough for my hubby. He really wanted the American Flag hat, but it wouldn’t fit. Too bad for him! I get to keep both hats! Enjoyed the mystery and like what we got much! HooRags are Awesome!! Great lightweight hats! Quick shipping and cool products! Very pleased, fast shipping, I was impressed with the first one so I bought another! Fast shipping with that one also, both arrived a day earlier than expected. I got a ball cap plus 2 hoorags and a sticker in the first, then a winter hat with 2 hoorags and a sticker in the second, I would definitely recommend this! I had a lot of fun opening up this mystery box. I was surprised to see all the fun goodies I got. I was given a few hoorags, some stickers, and a hat. My favorite hoorag that was in this batch is the american flag one. As with all Hoorag merchandise each item is of high quality and well made. I love the breathable fabric too! Nice surprise for my husband! He was very happy with the mystery box!